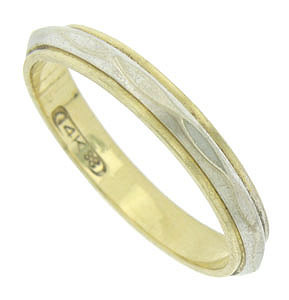 Simple, oval engraving stretches across the surface of this vintage wedding band. The 14K bi-color wedding ring features a central band of white gold which presses into a simple yellow gold ring. The classic wedding ring measures 3.05 mm in width. Circa: 1940. Size 7 1/4. We cannot re-size.